This book critically engages with the concept of European identity and citizenship, and the role of the European Union in diaspora, membership and emigration policies. It presents original research on European governance of emigration and citizenship and considers European integration in a global context. It questions whether there can be a European diaspora outside European Union, if European governance of emigration is possible and whether the EU can or should govern its diasporas in the global era. 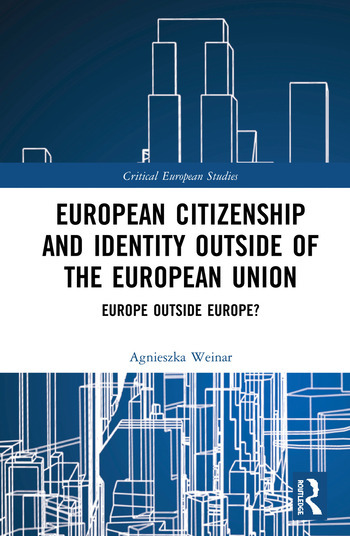 By engaging with concepts of European citizenship, diaspora and identity, the author examines the weak meaning of Europe for EU nationals living abroad and finds that European public spaces, present and sustained within the European Union territory, are largely not exported outside of it. Equal treatment and equal rights become empty concepts for Europeans leaving European Union as they lose their European citizenship. This book will be of key interest to scholars and students of European Union politics, European studies, migration studies, American and Canadian studies, and the sociology of migration. 3. Who is a European Emigrant in the 21st Century? Agnieszka Weinar is an Adjunct Research Professor at the Institute of European and Russian Studies at Carleton University, Canada.